The Village of Montgomery is served by two Park Districts. 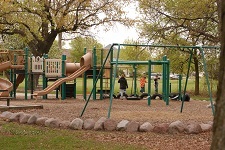 The Park Districts maintain all park areas and offer various classes and recreational activities for residents. In general, residents in the Season's Ridge and Marquis Pointe subdivisions are served by the Oswegoland Park District, while most other residents are served by the Fox Valley Park District. If you are not sure which Park District you are in, please contact the Village Hall at (630) 896-8080 ext. 9003.